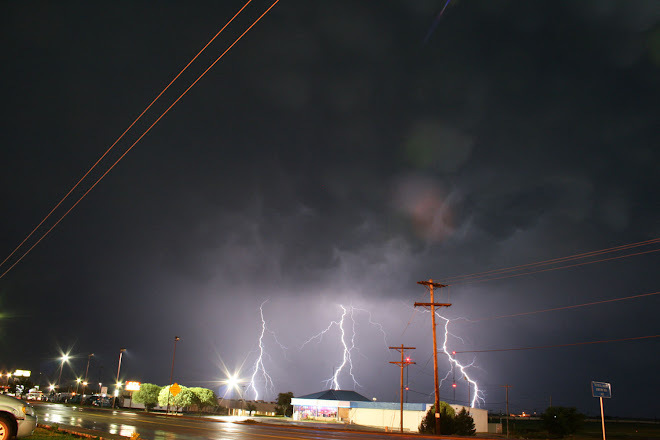 Storm Chase Logs: Sunday 17th June 2012 - SD/MN Mod Risk! After travelling to Pierre on Saturday to be in a decent position we awoke to the news that the SPC Had upgraded today to a Moderate Risk event mainly for South Dakota and Minnesota. The 10% Hatched box for Tornadoes would be in the extreme NE Of South Dakota and Western Minnesota. My target area today was Watertown along I-96, Nice and easy and quick to get to developing storms and also in an area of very good backed surface winds. The first storm of the day shot up around about 25 miles to our North near Sisseton, we took the interstate straight away and it did not take us long to be onto out first Classic Supercell of the day North of Sisseton. The storm looked great and was almost dragging the floor of those lovely South Dakota green hills, a tornado warning was issued for our storm and it was beginning to rotate with numerous lowerings from a string wall cloud, but as with too many times this year other storms were erupting east and west of our cell, in fact a trailing line was already evident all the way back to Aberdeen. Our cell was coming at us at a rate of knots so we took evasive action and headed south, running into another new cell which decided to dump some quarter sized hail on us in the process. 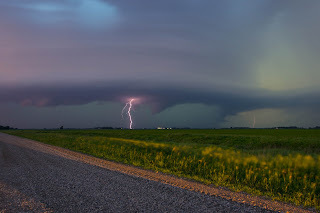 My only choice now was to head east back towards the Interstate and the Minnesota state line, after driving another 15 or so miles on South East zig zaggedy roads we finally got into a decent position to watch the supercells behind us, and to the north of us. An amazing site was unfolding with 5 Seperate rotating tornado warned storms all around us, there were even 2 discrete Supercells to our South East that had initiated in the warm sector and were visible to us with suspicious lowerings noted as well. The southern storm was an absolute mothership of a HP Supercell, we stopped briefly to get some pictures of this. 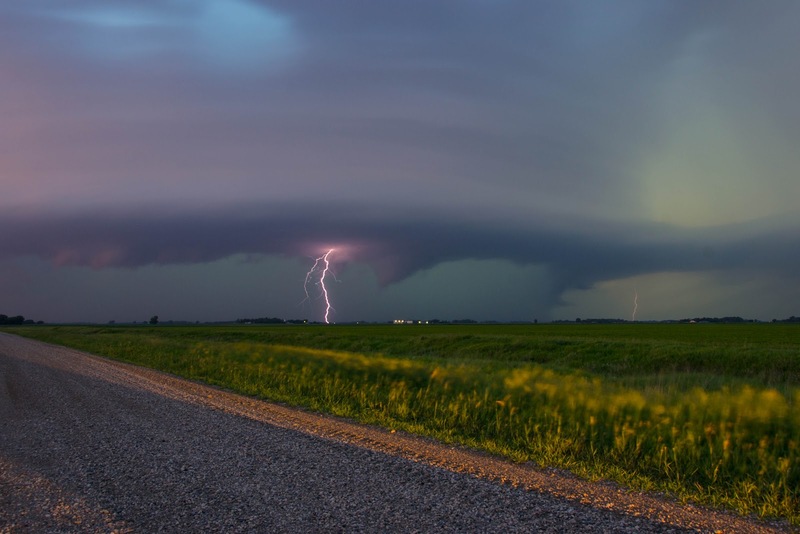 Mothership Supercell on the South Dakota and Minnesota Border. We continued eastwards and watched all of the cells intently, whilst travelling near to an Intersection little Ian shouted out Tornado, and sure enough just a few miles to our North was a very nice Cone Tornado on the ground with one of the five Supercells we were trying to watch, this Tornado would have been near to Wheaton (Minnesota) and was at 7pm Local Time. We now decided that seeing as the storms further west were starting to go linear that we make a play for the two discrete Supercells just to our east before the squall line munches them. So we motored east and then south to take a look, unfortunately these storms were quite junky looking and the line was advancing at such a pace we would not be able to chase these anymore, so we went further south still to try and be in place right at the bottom of the line to see if anything pops out of this HP Mess! Lightning photography was almost impossible with such strong outflow winds but Claire managed an absolute beauty of a Cg and Structure. The Supercell was cycling between outflow and inflow and in one of the cycles gained a brief Tornado warning, we noticed lots of funnel clouds and weak rotation but nothing stone cold on the ground. Knowing that the next days risk was going to be in Wisconsin we headed further east for the night to Minneapolis St Paul in readiness for more new ground, namely chasing in Wisconsin.